Kevin Pietersen scored a crucial century as England edged towards avoiding the follow-on during a gripping day of Ashes cricket at Old Trafford. Pietersen's 113 and half-centuries from Alastair Cook and Ian Bell hoisted the hosts from a perilous 64-3 to 294-7 against Australia at the close of day three, 233 behind and 34 short of the follow-on target. With rain forecast for Sunday and Monday, Australia's chances of forcing the victory they need to keep their Ashes hopes alive may hinge on whether they can take England's last three wickets cheaply on Sunday morning and ask them to bat again. After Jonathan Trott (5) and Cook were dismissed in the morning session, a partnership of 115 between Pietersen and Bell steered England to a relatively comfortable 225-4. But after Bell was bowled by Ryan Harris after tea, Mitchell Starc removed Jonny Bairstow for 22 and Pietersen to get Australia right back in the hunt. Matt Prior and Stuart Broad survived a nerve-wracking final half hour to take England into the fourth day without further damage. Pietersen's 23rd Test hundred took him past Graham Gooch to become England's highest scorer in all forms of cricket on 13,224 runs. Although it was by no means his most fluent or commanding innings, it must surely rank among the most important he has played. There were moments of brilliance - he impudently pulled Starc for two fours in front of square and lifted off-spinner Nathan Lyon for consecutive sixes to bring up his fifty - but also several slices of luck. 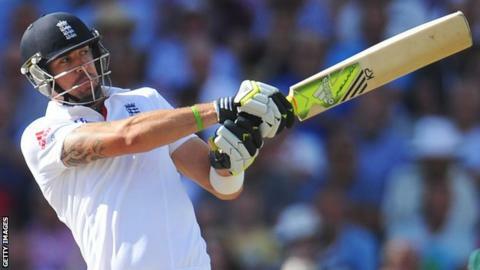 "England were on the ropes before lunch so Pietersen had to score a hundred and he did. "He also had to work hard for it, and when Pietersen has to work hard, somehow it makes for more worthwhile viewing." On three occasions, thick inside edges avoided the stumps and raced to the fence, while a brace of airy heaves into the leg side somehow dissected the outfielders. Then, with Pietersen on 62, Australia chose not to review a Shane Watson lbw appeal that had been rejected by Tony Hill, a decision that replays suggested was incorrect. When England resumed on 52-2 in reply to Australia's 527-7, the tourists made an early breakthrough as Trott went back to a rising delivery from Harris and guided a thick edge to second slip. Pietersen's early edginess contrasted with Cook's calm at the crease, as the England skipper brought up his fifty off 138 balls. With lunch approaching, however, Cook feathered a ball from Starc down the leg side and was brilliantly caught by a diving Brad Haddin for 62, the ball lodging in the webbing of the wicketkeeper's right glove. The afternoon session belonged to England as Pietersen and Bell drew on all their experience to repel everything Australia captain Michael Clarke threw at them. Lyon was hit out of the attack as Pietersen launched sixes over long-on and long-off before Bell smashed the spinner down the ground for another maximum. Bell, whose centuries in the first two Tests were crucial to England's victories, continued to bat with confidence and composure as he unfurled some trademark cover drives and late cuts. His chances of becoming the first England player to score hundreds in four successive Ashes Tests were ended on 60 by a fine piece of bowling by Harris. After a run of away-swingers, he got a ball to nip back through the gate and clip the top of off stump. Once again, Bairstow failed to convert a promising start into a score of substance. A lack of footwork to a ball shaping away proved fatal as an edge carried to Shane Watson at first slip. When Pietersen was lbw after playing down the wrong line to Starc, suddenly Australia sniffed a chance to wrap up the England innings before the close. With men gathered around the bat and a full house staying to witness the denouement, the tension was palpable. But the out-of-form Prior (6no) and Broad (9no) held firm to sneak England towards the potentially pivotal follow-on mark. Relive the key moments from BBC Test Match Special's commentary. Listen to the Test Match Special podcast as Geoffrey Boycott and Jonathan Agnew review each day's play.